You are saving 30% by getting the Bundle! If you love to have something meaningful and manageable that you kids can work on while you are working with your small groups in reading and math, you have come to the right place! 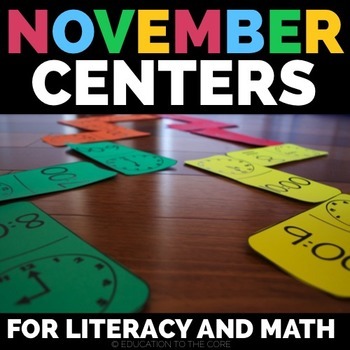 Ten Literacy and Math Centers all bundled into one product at a great price! All of these centers come with Blacklines and have student-friendly direction pages. 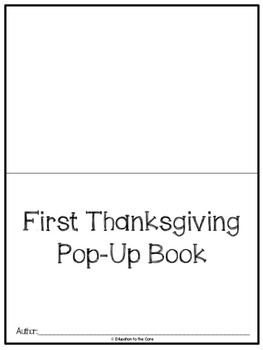 Also included is a pop-up book for writing about Thanksgiving! A Thanksgiving themed Pop-Up Book (3-D) to create great wonderful learning artifacts and memories! Fun, easy, and unique to your taste! You and/or the students choose the pictures, offered in both black and white and color. 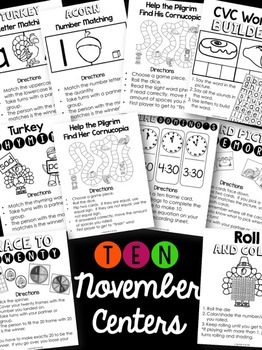 Students can then write about what they did and learned during their First Thanksgiving Unit, or perhaps write a creative letter to take home to parents. How you use the book is entirely up to you! 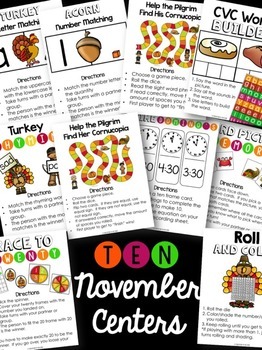 Students can write about some of the things that happen during the Thanksgiving season, or they can just write different words they know that relate to their learning. Use it how you want it, and scaffold appropriately. Click to See What’s Popular NOW!